Monkfish is a very dense, moist fish. Up till now, I've steamed it and done a sweet and sour take on it with ingredients like apricot jam and Asian sour figs or have gone more Mediterranean by roasting it with sun dried tomatoes, lemon and basil. Both excellent options, but I recently heard about grilling it - and the results are delicious! 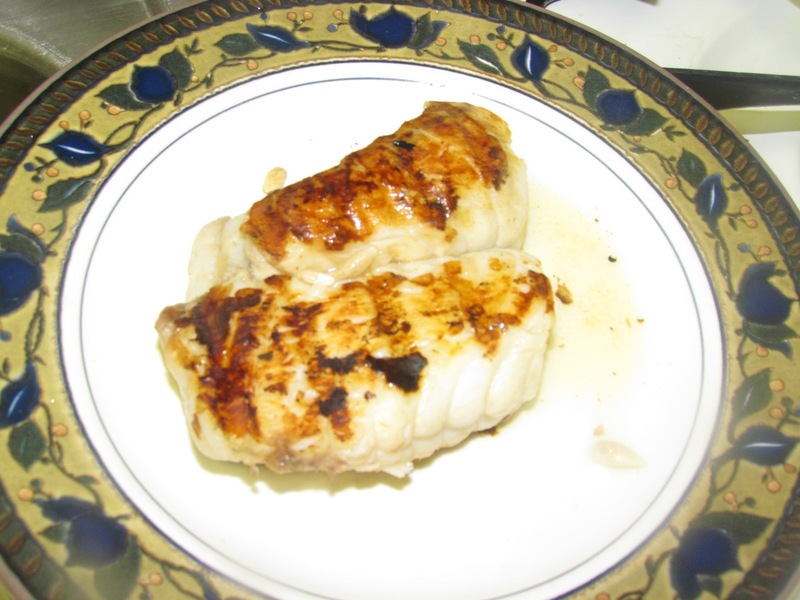 Monkfish is called the "poor man's lobster" because it has the consistency of a lobster tail but is much less expensive. Citarella's sells it for $14.99 a pound. So we're talking $7.50 per serving. I never considered grilling it because it's very thick in addition to being moist. But if you get your fish monger to butterfly the fillet you solve the problem of it being too thick to grill. You can tackle the moistness issue by drying the fish off with paper towels, then covering it with coarse sea salt, wrapping it in more paper towels, and letting it dry out for a few hours in the fridge. and wrap in paper towels. Let stand for a few hours. Don't worry about all that salt. It's there to draw the moisture from the fillet. When you are ready to start grilling shake off the salt and wipe off any residual salt with paper towels. Hopefully you buy your paper towels at Costco because this recipe uses a lot of them! But it's worth the investment. 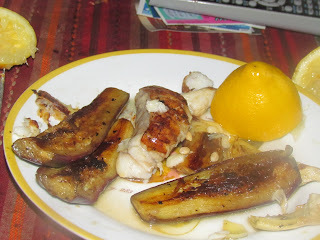 Never have I had monkfish that really tasted like lobster tail. Next is the marinade. I use chopped fresh garlic, lemon zest, lemon juice and extra virgin olive oil. I use the oil mainly so the monkfish won't stick to the grill. I use my George Foreman grill for this recipe but if you don't have one, a cast iron skillet will do the trick (but put on your list of things to do: buy an electric grill). If you have an actual outdoor charcoal or gas grill, fire the baby up. Grill for 2 - 3 minutes on each side. Note for electric grill users: I don't put the top down and cook both sides at once. I grill each side on its own and put the cover down at the end for about 30 seconds. It's very easy to overcook this dish so be careful and err on the side of undercooking. You can always toss it back on the grill if you have to - but once it's overcooked, that's it. 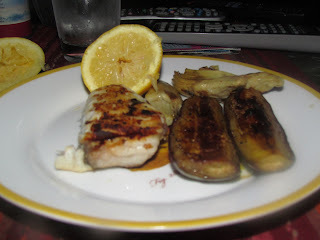 I serve the grilled monkfish with grilled baby eggplant - a match made in heaven! Grilled asparagus would go nicely, too. So even if you aren't a poor man, check this dish out!